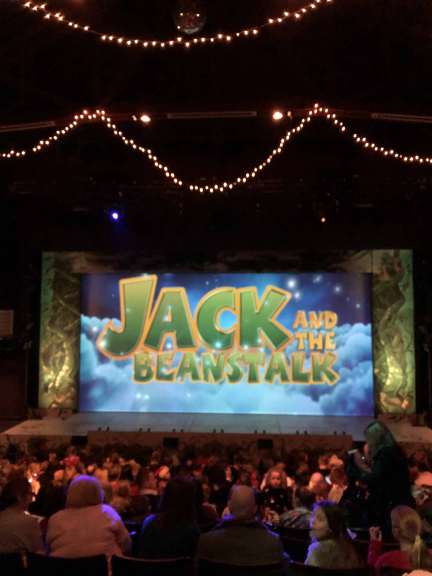 There's no better way to get into the Christmas spirit than a British panto and at thebestof Epsom & Ewell we were lucky enough to be invited along to see Epsom's 'Jack and the Beanstalk' this year. To some, pantos might seem a bit silly but the quick-wit of the show's star Mark Hudson, who plays 'Dame Trott', meant we found ourselves crying with laughter! Mark, who has been playing pantomime dames for over 16 years, was supported by the presence of larger-than-life 'Fairy Heav' - Cheryl Fergison, best known for formerly playing Heather Trott in the long-running soap opera Eastenders and her sidekick 'Silly Billy' - played by Holby City actor Luke Roberts. If you're going to book to see this panto, don’t expect to stay in your seat...there's lots of audience participation (which the children adore), sweets will be flying through the air and you might even find yourself giving this year's hit dance move 'the floss' a go! As you’d expect from a Spiller Pantomime production, the scenery is fantastic and the costumes are outrageous and amazing - we're talking big hair, big skirts and crazy amounts of sequins! Our favourite scene was the '12 days of Christmas' skit - adding that festive feel to the show, with a modern sing-song full of amusing props, which the cast have to recite over and over until they make it through the list - just hilarious!